Managing debt throughout the year is the wisest approach to eliminating debt at Christmas. But there are eleventh-hour solutions to minimize Christmas credit card debt. Preparing a budget is fairly easy – it can even be fun. Sticking to the carefully written financial plan is often a different story. Unexpected expenses crop up through the year and foil the best laid plans. If the budget has extended its boundaries by Christmas, cast around for imaginative debt solutions. Be open and honest with children about what can realistically be afforded. Tell the kids how much money there is for Christmas and be clear about the restrictions of the Christmas budget. Explain what the consequences may be for the family if spending escalates. Maintaining mortgage repayments is more important to the family well-being than purchasing Christmas gifts. Keep the explanation simple, emphasizing that the spirit of Christmas is about loving and giving; not spending and getting. Help the kids learn more about St Nicholas, the original Santa Claus, who gave away his wealth to help the needy, the sick and the poor. Discuss different options for Christmas dinner instead of an expensive sit-down meal with all the trimmings. Allow the children to have input. Maybe the family could go out for a picnic or have a barbecue in a local park. If the climate doesn’t allow for outdoor meals, spread a rug on the floor, drag out the camping chairs, dress up in summer clothes and have an indoor picnic. Cook a Christmas brunch instead of mid-day or evening dinner, or prepare a special afternoon tea. These meal ideas will be less costly than a full-on Christmas dinner. It can be fun getting dressed up and serving hot dogs and cup cakes on a table set with the family’s best linen, crockery and glassware. Once the family’s decided on what kind of meal they’d like, make a list, and take the whole family shopping late on Christmas Eve. Take advantage of the Christmas specials often available before the shops close for Christmas. Use cash and avoid credit card debt if at all possible. Instead of giving any gifts, donate the gift of time to a local charity. First, talk to the family about charities. Ask what charities the children are most interested in and seek information so that they know something about the organisation they’re volunteering for and what might be expected. Let the kids help with researching local churches, food-banks, homeless shelters, SPCA and other charitable organisations that may need help over the Christmas holiday. Volunteering could involve helping to dish up (or clean up after) Christmas dinner, delivering meals, wrapping gifts, reading to a child in hospital, or spending time with an elderly person. Volunteers could feed animals at an animal shelter, clean cages, or even provide a temporary home for an abandoned animal. Buying Christmas gifts for even a small extended family can be expensive. Suggest that each person buys only one gift for one other person. Allocate the gift-buyer and the receiver by holding a draw. Suggest that the whole family combines the available funds and makes a donation to a selected charity. If there is dissent hold a draw for various charities and choose a different one each year. The same idea could be applied to amalgamating available money and buying one special gift for just one family member each year. Parents could forgot gifts to each other altogether. Encourage children to make their own Christmas gifts out of recycled items. If it is within budget children could be allocated set amounts to spend at charity shops or two-dollar stores. Use old cards and papers to make new Christmas cards, gift tags and Christmas collages. 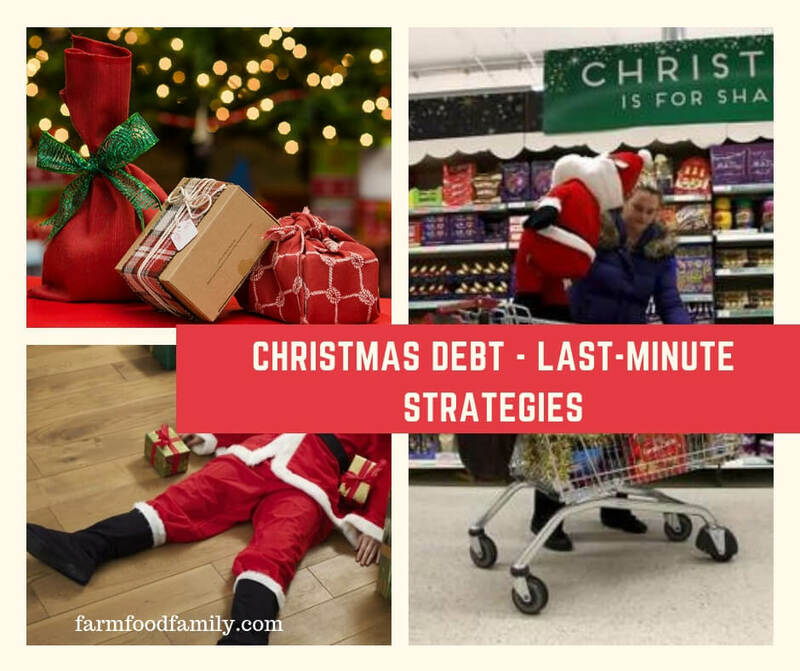 Planning, forethought and writing up a budget are the best ways to eliminate Christmas debt. Make every endeavor to stay within the budget but don’t abandon the financial plan if expenses have crept outside the boundaries. Examine the alternatives, involve the family, think laterally to minimize credit card debt at Christmas and steer the annual budget back on course as soon as possible.